Good? Bad? Is there even a word that encapsulates the Loons right now? One week after their worst performance of the season, a deflating 1-2 loss to bottom feeders New England, Minnesota United marched into the fortress of the defending Supporters Shield champs, and came away 2-1 winners. They will now head into their homecoming at Allianz Field with an impressive nine points through five away games. NY had more passes in the attacking third (234) than MN had total (233). NY had 41 passes in MN's penalty area. MN's most common pass combo? Metanire to Gregus. NY had 36 crosses, MN had 8. Some of that is due to the game states, of course. Had Minnesota been playing from behind early on, these totals may have looked different. But United didn’t exactly thrive on Saturday night. They survived. I’d be hard pressed to say that they were any more convincing in the run of play on the banks of the Passaic than they were a week earlier in the woods of Foxborough. The difference was all in the execution at both ends. Forwards Abu Danladi and Romario Ibarra stepped up and converted key opportunities. The two attackers had seen little to no action the week before. In the goal opposite, Vito Mannone went from goat in New England to GOAT in New Jersey. The former Premier League goalkeeper showed his quality at last with a host of impressive stops. In short, the team’s individual talent shown through and picked up a win against an opponent known for their work as a collective. This coming week is deeply meaningful for the entire club and supporters. It’s a relief that the team will head into Saturday’s Midway debut buoyed by a big win. At home, however, they ought to not just add three point points to their tally, but do so in a more convincing way than they have managed in the past month. It’s relatively acceptable to be outplayed on the road if you have enough grit and luck to escape with the win now and then. That won’t fly at home. 5. Ángelo Rodríguez had another poor game, except for when he didn’t. For the second straight week, the Loons tried to play with Rodríguez as a backboard in midfield, launching balls upfield for him to win, hold, and distribute. The idea is sound, but when it’s all that you’ve got, it becomes predictable and easy to handle. The Red Bulls had very little trouble containing any Rodríguez-centered combinations all night. But(!) the Colombian managed to end the night having made vital contributions on both Minnesota goals. The difference was that, on both occasions, he received the ball far up the field, either inside or near to the opposing box. This makes a big difference, because it immediately increases the stakes for any defender engaging in a physical battle against the big man. Defenders can wrestle him for the ball at midfield with little concern if a foul goes against them. Defenders cannot do that in their own box. In the box, Rodríguez also needs to be treated as a threat on his own. Defenders don’t have to be particularly concerned if they get beaten one-on-one in midfield by a man with the pace of a Texan accent. But in the box, where you can’t leave the possibility of a shot open, he commands more respect. The Loons scored their opener on a beautiful sequence in which Rodríguez did fantastic work to control a difficult ball and then pass it across the box for Danladi. The second goal was mostly pure luck, after Rodríguez controlled the ball well again, had a shot easily blocked, and the rebound spun perfectly to Romario to volley home. Just as you might celebrate Minnesota’s execution in key moments, while worrying about their play overall, so did Rodríguez have two great moments which were surrounded by seventy four minutes of ineffective play. Even on Saturday night, I have a hard time believing that the DP striker offers the club more on the pitch than either Abu Danladi or Romario Ibarra would. His liabilities are just too stark, his abilities are just too limited. But I have little doubt that Adrian Heath will feature him again this coming weekend. If that comes to pass, the least the team could do is work the ball up the field using their wide players, and get Rodríguez the ball only once he’s in the box and players are ready to make runs off of him. 4. Vito Mannone had a great game. Through the first three games of the year, the Italian had impressed mainly with his superb handling, but the game had never truly rested on his shoulders. Then, against the Revolution, Mannone had a moment to make a big stop, then flubbed the opportunity and ultimately the result. He responded in a big way against the Red Bulls with five saves, three of them difficult. He was sharp to the ball in his box, made a couple nice catches, one great diving interception, and one excellent punch (something he does probably better than any other MLS goalkeeper). He can feel unlucky that the hosts (literally) squeezed one through to ruin his clean sheet. If you are looking at the biggest single difference between the matches in New England and in New Jersey, the man in canary yellow in goal was it. A deserved man of the match performance. 3. Improvement, but not enough on the wings. Last week I was critical of the inability of Minnesota to get their fullbacks forward and provide width and numbers in the attack. They did better this time. Both Francisco Calvo and Romain Métanire each had a pass that led to a goal. Still, the Loons need to get more out of their fullbacks, especially Calvo. The Costa Rican plays the role differently (or, his teammates play him differently) than his opposite number. Whereas Métanire is closely involved in combinations, or in bursting forward for a ball in space, Calvo is more often looking to be the target of a long crossfield switch. He is less frequently involved in short combination play or played into space. Minnesota ought to use him more often. This is a pass that Greg Berhalter teams hit. I know Ján Greguš is capable of that driven diagonal out wide, hit from between the two centerbacks. The Loons looked Calvo off a lot against New York, which was often a mistake, since he was wide open and other players were not. They need to be more deliberate about getting the ball out wide in the attacking half to their fullbacks. 2. The 3-4-3 was helpful. It wasn’t like flicking a switch and seeing a sudden improvement, but Minnesota’s shift into a 3-4-3 made sense, given the absences of all three players (Darwin Quintero, Kevin Molino, Miguel Ibarra) who can play as a withdrawn striker or playmaker. The effect on the attack wasn’t as big, since the gameplan was still to play through lumping it up to Rodríguez. But in defense, the extra centerback was helpful. 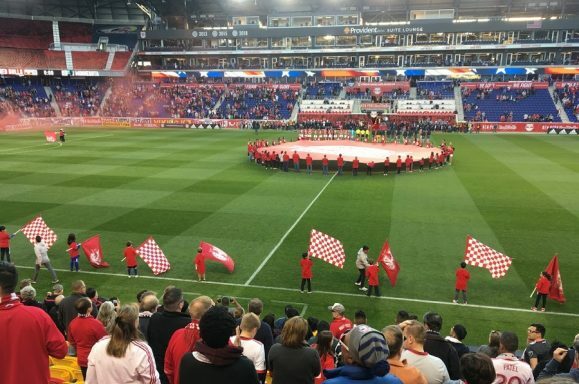 Michael Boxall, Ike Opara, and Brent Kallman all had good moments of emergency defending, and the middle of the box was so gummed up for the Red Bulls that they could not find enough space to do damage. It was intriguing to see Kaku, the star playmaker for the men in red, reduced to passing sideways in the area atop the box. This was the player, after all, who Club América had pursued before being rebuffed, and turning next to Minnesota target Nicolás Benedetti. Who knows what would’ve happened in a world where Benedetti had arrived in Minnesota. But thanks to their numbers in the middle of the field, the Loons at least got to simulate a world in which Kaku was not a factor on the field for the Red Bulls. 1. Miscellaneous Notes. Forward Madison played their first ever competitive match on Saturday, falling 0-1 to Chattanooga Red Wolves. It was a disappointing result for the Mingos, but Minnesota fans ought to be thrilled to see all four young loanees get the start. Watch the highlights to see two great attacking passes by Carter Manley (almost scored by Mason Toye) and Wyatt Omsberg, as well as some dodgy goalkeeping by Dayne St. Clair. Hopefully they get a better result next week and hold down those starting spots… …Since I moved to the east coast from Minnesota, I had seen the Loons play in person eight times, all of which were losses. On Saturday, I saw my first ever win. Not a curse!… …Abu Danladi left the match at halftime, and after the game Adrian Heath explained that it was always a plan to limit his minutes. That’s good to hear, but I was close to Danladi for the entire first half, and I saw him stop to stretch his leg multiple times, and he seemed to occasionally be in some discomfort. Hopefully there’s nothing to it, because if he ever gets a string of healthy games, I’m convinced the Ghanian could be a force… …The Red Bulls had a great atmosphere, despite a crowd that looked to me to be around 15,000, with large sections of the upper deck tarped off. That’s a testament to what good stadium design can do for noise. But man, the Red Bulls deserve so much better support than what they get. It is absolutely criminal that in a metro area of eighteen million, there are not 25,000 people in that stadium every night… …One final thing about Ángelo Rodríguez. After the entire team (save Vito Mannone who was being interviewed and the reserves who were doing sprints) had left the field, Rodríguez noticed a couple of Minnesota fans along the far side of the field, and made his way over to them, stopping multiple times to also take photos with Red Bulls fans. It was a classy gesture.